Buckhead has a new hotspot bringing the heat, meat, and sweet treats. Chama Gaucha is a much needed addition to Atlanta’s fine dining scene. 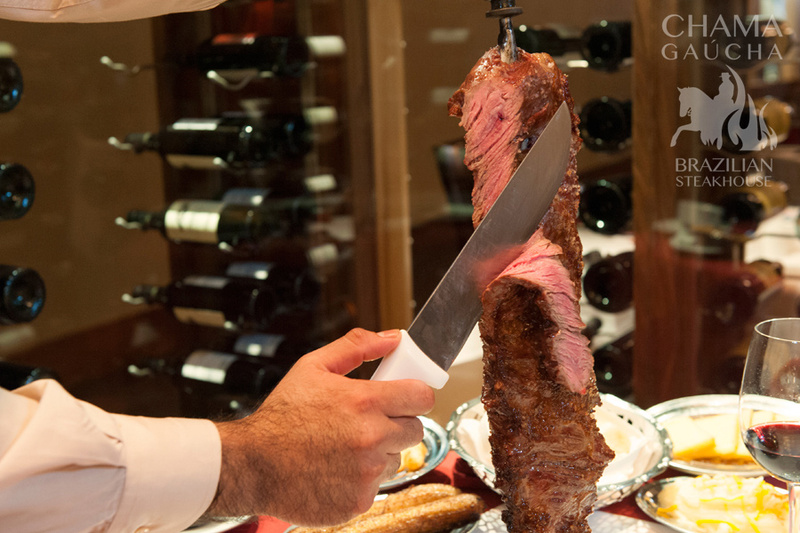 No offense to other Brazilian steakhouses, but the whole experience at Chama Gaucha is 5 stars from start to finish. Pretty Southern was privileged to attend a VIP tasting experience at Chama Gaucha. Check out our Tastemade video to see more! The ambiance at Chama Gaucha is simply stunning. Drawing inspiration from the menu’s Brazilian flavor and style, local design, construction and consulting agency Restaurants Consulting Group transformed the restaurant into a chic, open atmosphere providing a posh environment for sipping caipirinhas, cocktails, or a glass of wine from a stellar list of options. The bar extends to a covered patio with a fire pit, perfect for the summer nights quickly approaching. There’s also a private dining room which I’m seriously considering for my birthday celebration. Now let’s talk about the food. The “salad” bar is so much more than that. A superb selection of salads, fresh vegetables, charcuterie, cheeses, gazpacho, smoked fish, chicken salad, southern Brazilian-style potato salad, and fresh breads are prettily presented appetizers. As my husband said, the salad bar is impressive but at Chama Gaucha it’s really all about the meats. Beef is the star of the show, with the house special showcasing a prime cut of sirloin. There’s not just one but two types of filet mignon plus rib eye, bottom sirloin, and beef rib…just to name a few. There’s also sausage, pork rib, bacon-wrapped chicken, lamb chops, and delicious grilled shrimp which I just couldn’t get enough of. Are you drooling yet? Dessert is also a must at Chama Gaucha. Since our dining experience was all about indulgence, we opted for the molten chocolate lava cake as well as the layered chocolate mousse cake. All in, if you do cocktails, wine, dinner, and dessert, plus tax & tip you can expect to pay around $75 per person. I promise y’all, it’s worth every penny and I can’t wait to go back again soon. Chama Gaucha is located at 3365 Piedmont Road, NE, Suite 1350, Atlanta, GA 30305. For more information, check out their website and like Chama Gaucha Atlanta on Facebook.